With this LED light plugged in, you’ll always have light when you need it most, working as a night light, flashlight, or emergency light. The light can be activated by motion so you can be sure energy is not being used when it is not needed. Movement can be detected from up to 12 feet away in a 100 degree radius. Unlike traditional bulbs, the LED stays cool to the touch, making it safe to use around children and pets. A photocell also detects sunlight to turn the unit on at dusk and off at dawn when the room is filled with natural light. Unplug the unit and use as a portable or emergency flashlight. Three rechargeable NiMH batteries are included to power the unit for up to eight hours when power is removed. 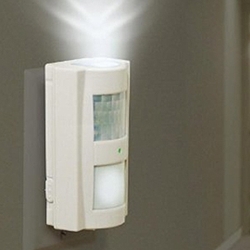 In the event of a power outage, this LED automatically lights up so you’ll be able to see until power is restored. Plug the LED in so the light is facing up for a gentle nightlight or facing down to light pathways. Since the light only turns on when needed, you’ll keep your home energy-efficient as well as safe.